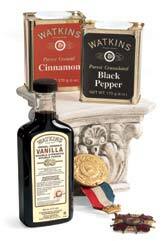 Click below to view the Watkins product line. See what's on special this month and write down the item numbers for products you want to order. 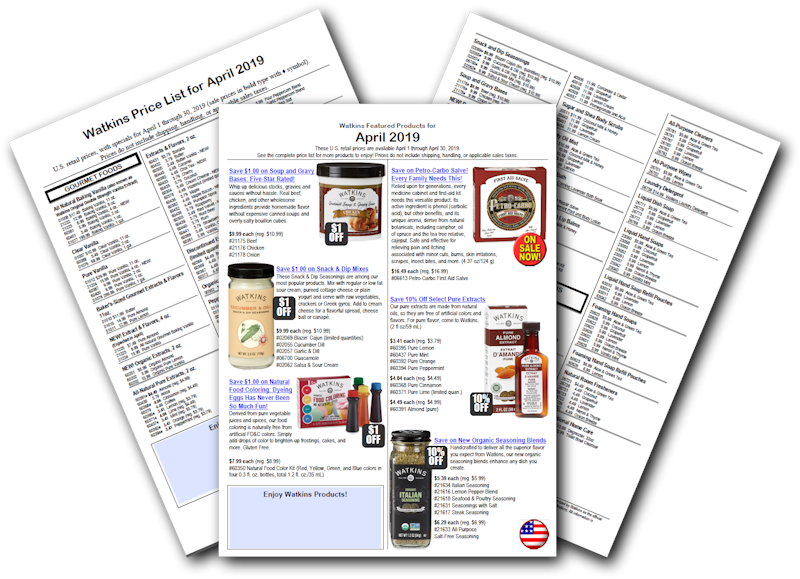 April Price List of All Products—U.S. An updated version of the Master Catalog will be posted here in mid-afternoon on Wednesday, May 1. Problems viewing or printing? Try saving the file to your computer first: Right-click the link above for the document you want, then choose "Save File As", "Save Target As", or "Save Link As" from the small menu that pops up. This will let you save the file to your Desktop or other location on your computer where you can find it easily later. Close or minimize your Internet window. Find the PDF file where you saved it, and open it. It should open and print fine. If this suggestion doesn't work, get a friend, neighbor, or local print shop to help you—ask them to visit timelessintegrity.com/prices and print the materials you want. * Notes: 1) Insect Repellents are only available in Canada. 2) The Master Catalog is published a few times each year, showing regular suggested retail prices (see the other documents above for this month's sale prices). This online version of the Master Catalog is not formatted for printing, but you can still use it to plan your order and see descriptions/photos of the full product line. TimelessIntegrity.com is recognized by the Watkins Company as the official training and support site for all Independent Watkins Consultants. This site is created and maintained by the Independent Watkins Consultants who are part of the field leadership team. The statements made and opinions expressed on this site are from these leaders and have not been specifically reviewed by the Watkins Company.